Our top-quality money counter and counterfeit detector devices will ensure that the hard earned money your company generates is legitimate, properly sorted, and accurately counted. 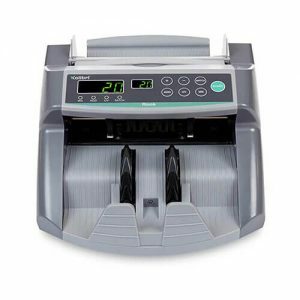 The Signature mixed bill money counter machine guarantees correct cash counts while also improving the productivity of your business. Its 2-pocket design enables it to instantly place a suspect bill or wrong denomination into a reject pocket. This prevents slow-downs, adds extra convenience, and makes dealing with counterfeits easier. The Rook enables you to rapidly and accurately speed through stacks of notes at a counting speed of 1400 notes per minute. During the counting, it automatically scans the money using top-of-the-line magnetic ink and infrared counterfeit detection systems to reliably prevent illegitimate bills from getting through. The KCD-2000 utilizes multiple detection methods to swiftly and easily ensure the authenticity of the cash your business receives. It checks each note using ultraviolet, infrared, size, and magnetic ink security features to unerringly spot counterfeit US currency. Finally, its ability to check notes in all 4 orientations is a considerable time-saver. The Ace easily switches between Manual and Automatic modes. It also features 4 different operational modes that cover any counting needs your business may have. During the counting, it scans each note using magnetic ink and ultraviolet detection systems that stop any counterfeit notes in their tracks. Unlike most currency counters, the Domino reads banknotes as they’re fed through and automatically detects their denomination, preventing misplaced bills and sorting mixed denomination stacks. Its small size, adjustable counting speeds, and advanced counterfeit detection systems make it the ideal choice for any business regardless of size. Our products come with a 1-year warranty that covers manufacturing defects and device-related failures that happen as a result of regular operation while observing the guidelines outlined in the owner’s manual. The warranty doesn’t protect against issues and failures that occur due to improper use, unauthorized opening and maintenance, mishandling, tampering, or mishaps. 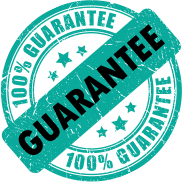 All our products are highly reliable devices that improve the long-term health of your company by streamlining the counting process and protecting you against counterfeits. 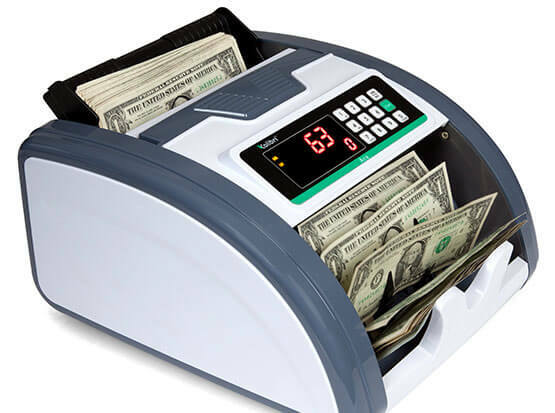 In this day and age, a dependable money counter and counterfeit note detector is invaluable to any business that works with cash. 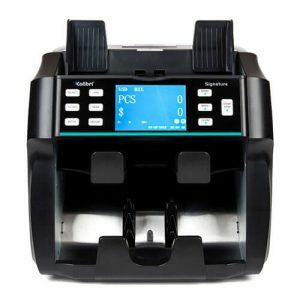 At counting speeds of 800, 1000, 1200, 1400, and even 1500 bills per minute, our counterfeit detector, bill counter and sorter solutions provide unparalleled efficiency and convenience to your business. An automatic cash counter removes the “human error” factor from your money counting by unfailingly supplying 100% accurate counts. Inbuilt counterfeit detection systems stop illegitimate bills more reliably than any other method. All of our products come equipped with at least a 1-year warranty that shields you against device-related failures and manufacturing defects, therefore ensuring uninterrupted functioning and preventing productivity loss for your business. High-end infrared, ultraviolet, magnetic ink, and size detection systems ensure that your cash is counted rapidly and correctly, while also protecting your company from fake bills. Compact design adds further convenience. Kolibri products are expertly designed to be used effectively by people with no previous training. Simply follow the instructions outlined in the user manual. The products work out of the box, with no special setup needed. Our range of money counting and counterfeit detection products is designed to offer solutions to all businesses which work with cash on a regular basis, regardless of size. Our highly competitive pricing reflects that. Every day, large amounts of cash money pass through small and large businesses alike. The importance of ensuring that these bills are counted correctly and that no counterfeit notes are accepted is obvious. What business owners rarely consider, however, is the speed at which these bills are counted and sorted. Manually counting and checking each bill slows operation and hurts your business regardless of whether you’re running a restaurant, a convenience store, a nail salon, or a dispensary. 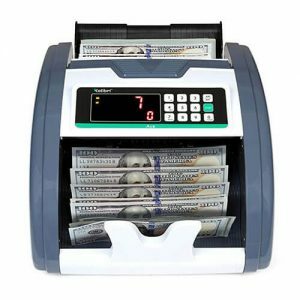 Our counterfeit detector and mixed currency counter machines are expertly engineered to simplify the counting, checking, and storing process in order to increase your company’s security and productivity. Being able to accurately count your cash earnings is of paramount importance to any business. People can count and sort small sums on their own, but mistakes happen and even the most diligent store owner or employee can become tired and careless during a busy 8-hour shift. Here at Kolibri, we manufacture automatic bill counter and sorter devices that solve this problem by supplying quick, correct counts every time. Our Kolibri Signature bill counter even has a special 2-pocket design that automatically separates different denominations or suspect bills from the rest. This greatly lessens downtime that occurs while large amounts of money are being processed, increasing the overall productivity of your business. In today’s world, anyone can go to a store and buy a high-end home printer at an affordable price. This enables counterfeiters to easily produce low-quality forgeries that look real enough to pass cursory inspection. When hidden inside a wad of real money, these fake bills are virtually undetectable unless the person doing the counting manually checks each note for signs of foul play. Devices like Kolibri Ace and Kolibri Rook scan each bill as it passes through them using tried and true detection systems such as ultraviolet, infrared, and magnetic ink scanning. Should a forgery be detected, the device will immediately stop the count and alert you to the suspect note. A cash box or a drop safe is a simple, secure, and affordable way to effortlessly and discretely store cash money after a transaction. Kolibri drop safes feature a two-step security system and are designed to be bolted to the wall or the floor. Their sturdy construction and the impossibility of being carried away make them serve as a deterrent to thieves. 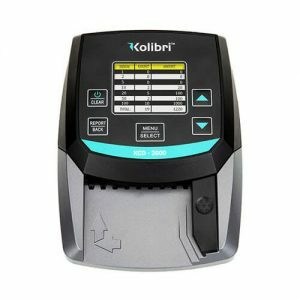 At Kolibri USA, we use our knowledge of automated bill counting and counterfeit detection technologies to provide business owners with mixed denomination bill counter and fraudulent bill detector solutions that are reliable, durable, and affordable. All our products are designed to be easy to use and to require no extra setup or previous experience. Everything you need to know to use the machine yourself or to effortlessly train an employee can be found in the user manual. This enables you to immediately reap the full benefits of having premier mixed money counter and counterfeit detection machines in your workspace. Some of the counterfeit detection systems we use include ultraviolet, magnetic ink, and size detection scanners. A UV detector checks the UV marks present on authentic bills by shining ultraviolet light onto the notes. This reveals marks made using special dyes that are only visible under UV light. A magnetic detector, on the other hand, uses magnetic detection to identify the metal threads and magnetic inks that are located at strategic points on the bill. 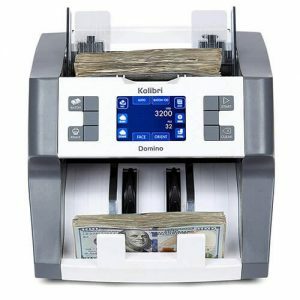 Newer, more modern counterfeit bill detectors, such as the Kolibri KCD 2000, can even find tiny deviations in size that instantly give away an unauthentic banknote. Every money counter and counterfeit detector machine we manufacture utilizes cutting edge technologies that ensure unmatched accuracy and ease of use. They also bring other, less visible benefits that are nonetheless important. By accelerating the sorting and counting process, bill counters also increase your speed of service. This improves overall productivity and customer experience. Furthermore, by taking steps to protect yourself and your business against fraudulent bills, you’re also making it that much harder for counterfeiters everywhere to successfully practice counterfeiting. 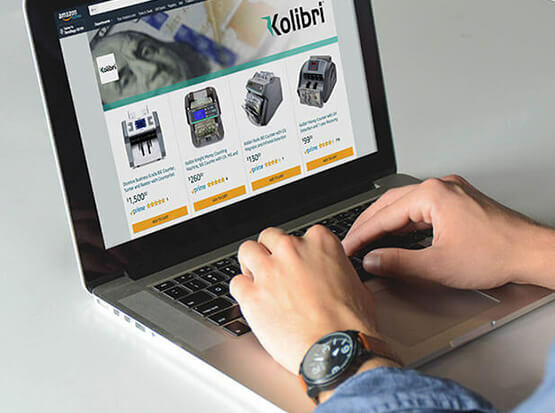 If you have any additional questions about Kolibri products, feel free to contact us today. Each device pulls the banknotes through a microprocessor scanner one at a time, moving them at speeds as high as 1500 bills a minute. The machines count the number of bills passing through based on how many times the beam of light is interrupted. The second layer of technology used in these scanners is based on pattern recognition. Pattern recognition enables the device to determine the denomination of each note by comparing it with the designs unique to each type of bill. Finally, the various counterfeit detection systems are used to determine if the banknote is, in fact, a real one.